"Brazil! I mean ... WOW! Four years ago when I was in college, if you told me I would be flying to the other side of the world to work on the most cutting edge research going, I would have told you, you had as much chance to become prime minister! But there I was on my BA flight (all expenses paid) to University of Sao Paulo in Sao Carlos. "When we touched down in Sao Paulo, we were quickly whisked away in a taxi to the hotel where breakfast was ready and waiting for us. It was on the first day that we met Alexander Maciel, the physics PhD student who had been at Bangor on a similar exchange and was keen to show us all that Brazil had to offer! 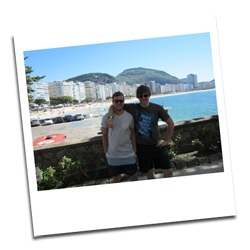 "Whilst in Brazil we worked on two separate projects, Paul worked on Organic Field Effect Transistors (OFETS) and I worked on Organic Photo Voltaics (OPVs) some pretty cool stuff! The work although fun, was hard going. But with anything worth doing when you get to see the device you created working, all the toil was worth it and more! Paul and I both broke records while we were there - Paul was able to manufacture one of the highest ever ON-OFF ratio devices made in the IFSC and I introduced flexible OPVs to the department. "At first, I was worried about the language barrier – they speak Portuguese in Brazil but it was not so bad. Most of the people in the IFSC spoke very good English but if you ever wanted to order lunch outside, I’d suggest ditching the phrase book and just get stuck in before you go! 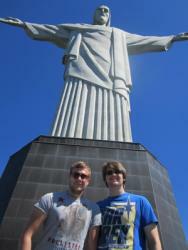 "When you think of Brazil, I bet you think of samba, beautiful beaches, monkeys, the Amazon, Rio and Christ the Redeemer! Well ... in Sao Carlos there is not much of that, which was great for our academic studies but we couldn’t exactly go to Brazil and not be touristy now could we? So, we packed our bags for a four-day stay in Rio! Yes, the professors gave the green light for us to have a long weekend away and honestly, I can say without doubt it is one of the best decisions I have ever made! Copa Cabana, Ipanema, Pão de Açúcar Christ the Redeemer! Fantastic! "Going to Brazil and taking the opportunity to work abroad not only gave me more confidence in my studies, motivation to become a better engineer and a willingness to try new things but also gave me a better perspective on the World. Quite frankly in the UK we have so many opportunities that we let slip by but if you’re given the chance to go and study abroad, grab it with both hands and don’t look back, I loved every minute of it, thank you Professor Martin Taylor and the school of Electronic Engineering for arranging for me to go." Watch Sean and Paul's video interview on BangorTV.